While combating the highly infectious Ebola virus disease (EVD) outbreak in West Africa, aid workers and other visitors have been inadvertently exposed and contracting the virus. In 2014, a number of infected individuals were evacuated from Africa and returned to the United States for treatment. The Nebraska Biocontainment Unit (NBU) was one of the several receiving hospitals for these patients. The NBU and Omaha Fire Department’s emergency medical services coordinated patient transportation from the airport to the high-level isolation unit. Following patient admission into this unit, biocontainment staff members relocated the ambulance to an isolated, controlled-access area to be decontaminated. All surfaces in the cab and patient compartment were thoroughly wiped with bleach solution. Then, as a final disinfection step, the back of the ambulance was exposed to ultraviolet light. 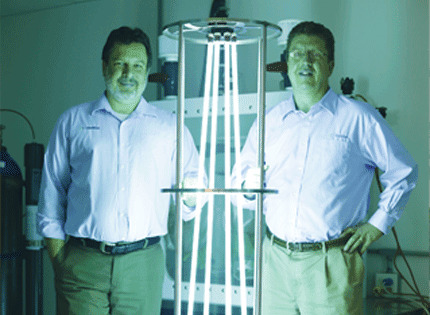 Ultraviolet light is a specific part of the electromagnetic spectrum of light that offers bactericidal effects. It is the wavelengths in the UV-C spectrum, which offer the greatest germicidal potential. UV-C provides a dry, chemical-free, and residue-free method of disinfection effective against bacteria, viruses, fungi and spores. For this reason, ultraviolet light disinfection was not only used in the ambulances, but as the final step in decontaminating medical equipment, patients’ rooms, and bathrooms after patients were discharged. 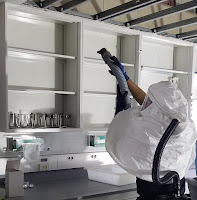 Acknowledging the known limitations that UV-C only disinfects the areas light can reach, the Nebraska Biocontainment Unit used four ClorDiSys Torch systems in tandem to ensure the proper exposure was achieved to inactivate the Ebola virus. 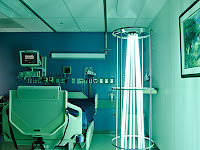 Read more about the effective use of ultraviolet lightdisinfection against Ebola here. Learn more about ClorDiSys Solutions’ Torch here.